Discarded plastic is unsightly, but it is Co2-heavy too. And this is a point which has not been made so much in the flurry of announcements, from the government down, on the subject in early 2018. While we grapple with eliminating plastic altogether, we might at least start making it from something sustainable. I look at a company doing just that. Who would have thought it would be the defining material of the start of 2018, for a time generating more column inches and media minutes than Brexit? Prime Minister May made eliminating it her standout positive policy of the New Year, aimed not only at the youth vote her party has to garner to survive, but also people like the solidly un-revolutionary readers of the Daily Mail, which has been campaigning on plastic waste for years. Within days of her speech, supermarkets, soft drinks producers and smart cocktail bars were tripping over each other in their rush to install plastic-free aisles, reusable containers and straws made from corn starch. Even so, there was confusion over the aspiration. Was the object to get rid of plastic so that it stopped polluting the marine world so eulogised by David Attenborough in Blue Planet 2, and accumulating in such an unsightly way throughout our towns and countryside? Or was it a call to arms against a carbon-heavy oil-based product, whose use added CO2 to the atmosphere and promoted global warming? I’m still not sure. One question dodged was: can there ever be a good plastic? Because even when we’ve swept away all the plastic bottles and plastic-lined paper cups that can be replaced with something renewable and refillable such as glass or bamboo, there are lots of things we are going to continue to need plastic for. And it can be recycled, even though much it currently is not. A small British company with a very big British name, ahead of the current plastic frenzy, had already addressed the question of how plastic is made. That’s Bulldog. And the men’s skincare company has every right to be smugly telling anybody who will listen that it is a pioneer in the use of an eco-friendly version of it. Instead of dispensing its product in unsustainable plastic made from oil that has been trapped in the ground for millions of years, Bulldog uses as its core ingredient something that can be grown in hot places in a matter of weeks, and then replanted. It became one of the first companies to sell its product in tubes that look like regular plastic, feel like plastic but are actually made from sugarcane, a renewable raw material. Bulldog points out that instead of releasing carbon dioxide, plastic from sugarcane saves it. It estimates that for every 100 tonnes of sugarcane plastic used in its tubes, 309 tonnes of CO2 are taken out of the environment. So while it is true that a Bulldog container could still end up in the middle of the Indian Ocean, just in time for Blue Planet 3, perhaps that is not the point. Bulldog’s tubes are recyclable wherever plastic can be recycled. And it is up to society – and governments local and national – to make that the recycling process works. Eliminating the container that makes the waste might not be the answer. Or even making them biodegradable, which Bulldog’s tubes incidentally are not. After all, even if we replace most plastic containers for glass, that glass would still have to be collected for recycling or reuse. So would biodegradable containers. It would still be preferable to gather them in, so they didn’t just lie around in the environment waiting to biodegrade. The use of natural and sustainable ingredients underpins Bulldog’s business. An idea came to founder Simon Duffy in 2005. He noticed that there were no straightforward skincare options for men who wanted products made from natural ingredients, and set about the product research, design and development to correct that. Two years later he launched Bulldog on the shelves of a leading British retailer. 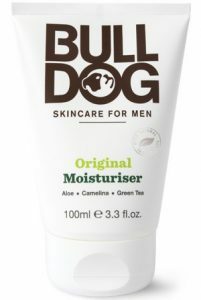 Bulldog started selling lotions, balms and pampering ointments into the growing market aimed at making the modern man facially comfortable and presentable. It offers a range of products that until recently we thought were meant for women, such as face scrub, protective moisturiser, lip balm, blemish target and “age defence moisturiser” – and some that obviously were not, such as beard shampoo and conditioner. I found some in my local Waitrose, but the company, which manufactures in factories in the UK, in Frome, Somerset and in Preston, Lancashire, is now selling its products throughout the world. The company pledges that none of its products, which are suitable for vegetarians and vegans, contain artificial colours, synthetic fragrances, the suspect chemicals parabens and sodium lauryl sulfate (SLS), or ingredients from animal sources. It uses among its ingredients the bee-friendly plant borage, grown on a farm in the UK, and camelina oil, pressed from the golden-orange seeds of the camelina plant, a member of the mustard family.